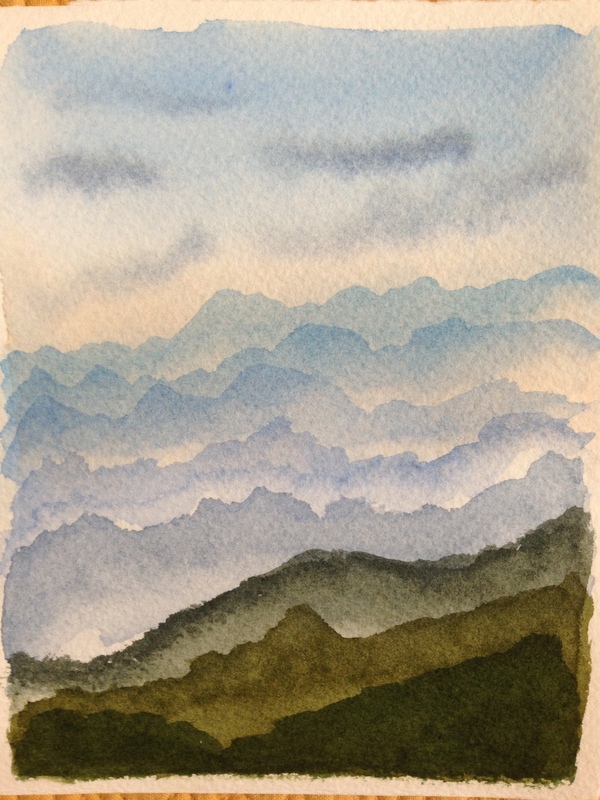 In the first piece, I followed a YouTube watercolor tutorial fairly closely, while in the second, I used the techniques I learned from the first to try and paint the imagery that came to mind while reviewing some scenes I’d photographed a year ago last May along Skyline Drive, in the Shenandoah Mountains of Virginia. Hub and I celebrated our 25th anniversary where our honeymoon began. It was really cool! We saw some bears and other wildlife, and had a good time. While looking over those photos from last year, a few leaped out and asked to be painted, but attempting to do so would elevate the work from a sketch to a painting, which at this point, I lack the time (and almost definitely, the skills) to do. More blue and green nature paintings…loving these. Thanks, I’m glad you do! More will be coming, because nature is my favorite subject, and those colors draw me big. Same here. I look forward to seeing them. Its coming quite nicely. Try getting more detailed in the foreground – a defined tree or two, rather than just using tone on it’s own. Thank you, Graham. The tutorial called for a tree in front, but it was afraid I’d wreck it, so I left it out. I need to work on watercolor trees. Thanks for your comment! Composition and depth … so many things to work on. One of the many hard steps we face is the fear of wrecking something. I say go for it and if you don’t like how it turns out, don’t let it get you down. It’s painful when things don’t turn out. I’ve butchered my share of drawings and paintings. Fact is I mangled a lion drawing last night by introducing oil pastels which I always struggle with but it was worth it.Taking chances is something I believe helps us find our style as well as frees us from fear of not taking an interesting looking pathway. Thanks, Dale, I’m going to go for it next time out. Didn’t have time to paint tonight but hopefully tomorrow. I appreciate your encouragement and thoughtful comments. Thanks, Jodi. Pretty soon, I’ll get to sit at the big kids table! Lol! Agree about the larger paper; sometimes you just need to go larger and give a piece more breathing room. These are very good. Wow I like those. Those are very peaceful to me. Both are moody in the best possible way for me. Thanks! I was moody while painting! It’s always neat (to me) when those emotions translate. I’m going to keep working at these little paintings, so hopefully….more to come. Atmospheric perspective is the first thing he covers in the perspective book! So this was a nice way for me to “get” that. I absolutely adore these! I live in the area and you captured my home- my heart- so well! They are breathtaking. I wondered if you’d share the tutorial that you watched? I was thinking about making a third and maybe sewing them into a quilt! But honestly, I wouldn’t mind selling them! Thanks, Sharon, I was thinking of possibly sewing them into a quilt (along with a third, yet to be created), that is if Arty-Kat doesn’t take them off my hands! 😀 I’m glad you like them! Please write me and tell me your asking price. I live near the WV and VA border…. And Shanandoah River is in the lyricsz! I’m so flattered that you’d consider buying them, truly. I’m posting the third one tomorrow. They all have something on the back of them too! Not sure if that matters to you. And a very, very small uneven border around the edges on all three too. The third is a landscape orientation, the other two are portrait, but all are the same size paper (about 4″ x 5″). Would you be interested in them if I made them into a quilt, or are you interested strictly in the paintings? Please let me know your email address. Thanks again! oh my memory is so bad….I just realized you already posted your email! I’ll get one out to you now. Paint behaving very well for you, lovely edges – great job! That’s the way it goes sometimes – onwards and upwards! Captured the tutorial well. Don’t you love learning thru these? I totally love them! Thanks! Nice size for this practice Laura – your distance worked beautifully! These are beautiful. I love the effect of the mountains fading into the distance. The clouds are great too. Thanks! It’s been a loooong road, but I’m starting to finally get a little better at clouds. Clouds are very challenging. I still don’t really know where to start with them. I hope this helps! I really love clouds and spent many a frustrating hour trying to capture them in wc. Just like everything else, try try again! 🙂 You are really good at watercolor, so you should have an easier go with it. Thanks. I mostly just let my watercolours do their own thing though. I’m not very good at achieving specific effects with them. Something to work on though. I’ll definitely take a look at that tutorial when I have some time. I think that may be why you’re so good with them. I try to control them too much. It works in your stuff tho!! Niiice! Reminds me of the Great Smokey Mountains. 🙂 I think I’ve said it before, but happy anniversary! 25 is a biggie! Thanks, Teresa! Yeah, the Smokeys are just south. On our honeymoon, we went on down a-ways, as they say. 🙂 I’d really like to explore that entire area in-depth. Would be really cool. Thanks, Jill! Yeah, I really like this size! I may increase it further here and there as I feel like I can build out a more detailed painting. I’m really working on clouds. 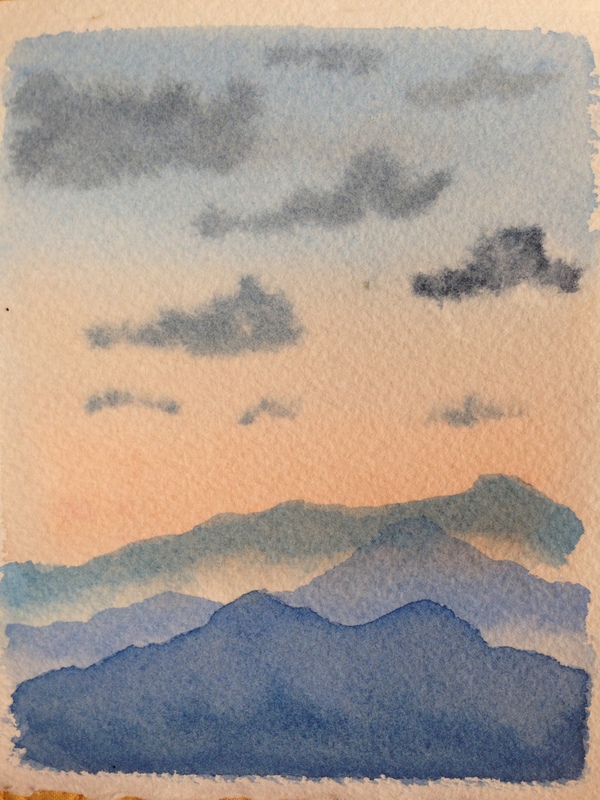 I’d love to do a whole skyscape. That’d make me very happy. I love them! Great work! Wow, the layers here are great. And it reminds me of some photos I took this weekend (to be posted soon). Well done Laura! Keep growing and expanding your talent and you will reap the rich rewards of personal satisfaction.